Edited by Mary A. Sofia. 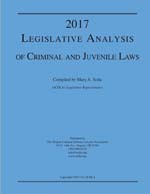 The 2017 Legislative Analysis of Criminal and Juvenile Laws contains summaries and complete enrolled versions of new criminal and juvenile legislation. Select the free PDF option at left (no credit card required). Watch your email for a receipt with a link to your download. Note: Previous editions of the Legislative Analysis (PDF only) are available in the Legal Document Library.